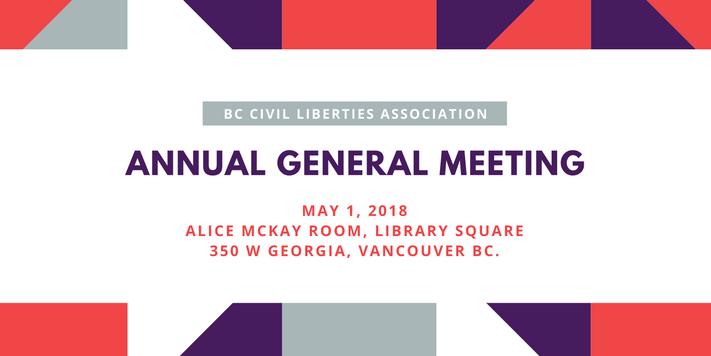 You’re invited to the BCCLA’s 2018 Annual General Meeting! BCCLA members and friends are invited to hear highlights of the BCCLA’s work over the past year, as well as our key priorities into the months ahead. We will also attend to usual AGM business and announce our newly elected Board of Directors. Learn more about our acclaimed candidates here. This year, we are delighted to host a panel discussion by Community Lawyer, Dylan Mazur, and Legal Consultant, Sonya Pighin where they will be discussing our Community Law program and the Policing Indigenous Communities Initiative. Click here to view the 2017 audited financial statements and our latest Annual Report. When: Tuesday, May 1, 2018. Registration and reception begins at 6:30 pm. Program begins at 7:00 pm. To make sure everyone has a seat please let us know if you’re coming! Changed your address recently? Add it here and we’ll update it in our records!